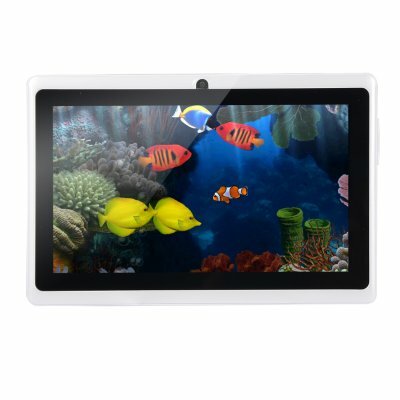 Successfully Added Wifi Version 7.0-Inch HD Display 30W Front Camera 512MB RAM+4GB ROM 2200mAh Tablet White (EU Plug) to your Shopping Cart. Equipped with advanced A33 quad-core master control, delivers fast and smooth user experience. 7.0-inch HD display, 1024*600 screen resolution, offers vivid and immersive visual effect. 30W front camera, let you chat with your family or friends face to face. With 2200mAh battery and U DDR3_512MB ROM: 4G, and support GPS, FM, Wifi, Bluetooth, OTG etc. Quick Boot-up, Rapid Apps Loading, Smooth Multi-tasking. Outstanding performance, thanks to the A33 quad-core master control, most of the games are handled without any problems. U DDR3_512MB RAM for Advanced Multitasking, smoothly run your games, photos and video-editing applications. 4GB ROM storage capacity, provides room to store pictures, videos, music and more. 30W front cameras for photos and face-to-face chat with family or friends.